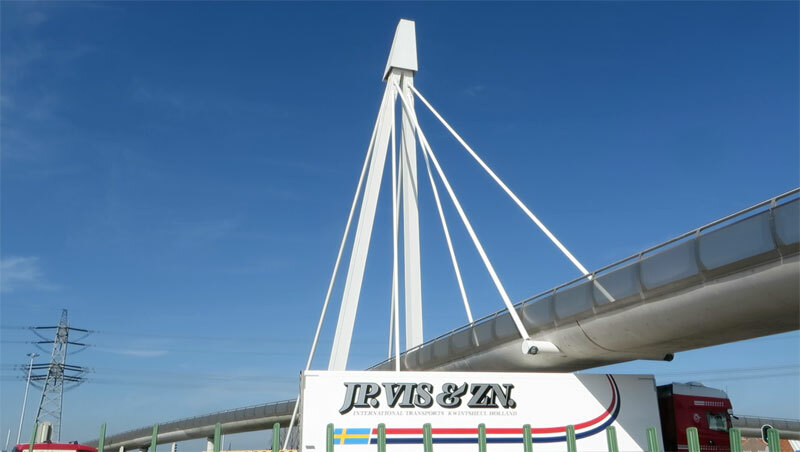 An enormous cycle bridge was built in Naaldwijk, and what was the reason? Flowers! Or to be more precise; flower transports. 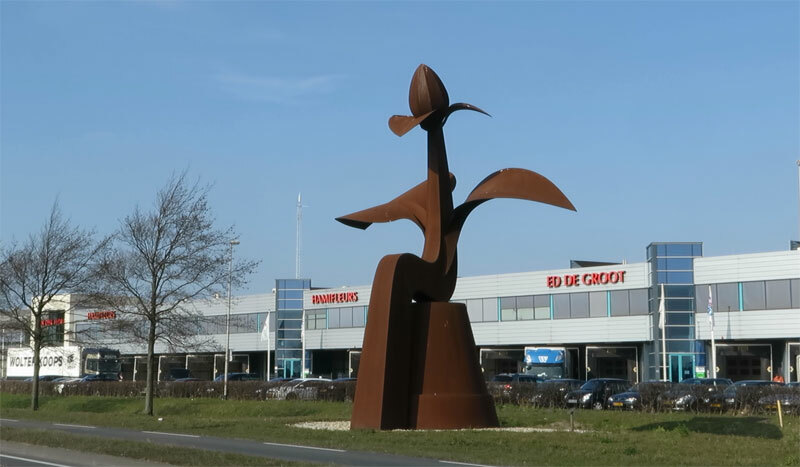 You have probably never heard of Naaldwijk, but it is home to the largest flower auction company in the world. A lot of the auctioned flowers pass through Naaldwijk to be taken all across the Netherlands, Europe and (via Schiphol airport) to the rest of the world. But the entire road network in the region was outdated. There are some motorways but they ended, causing congestion on the local roads that had to handle all these flower transports. The network is now being modernised in the so-called 3-in-1 project, that tries to kill three birds with one stone. One road-network update to increase accessibility, liveability and road safety. The new roads are reconstructed according to the Sustainable Safety policies and they are of a type that can’t allow cycling. That was already the case in the “before” situation – all the main through roads had separate cycleways – but now the main intersections are being constructed in such a way that cycling is completely separate at those intersections as well. That means people cycling will not only be separated in time (as they are on a signalised intersection) but also in place (as they are on grade-separated crossings). This will improve road safety for especially the most vulnerable road users. Two enormous new turbo-roundabouts are being constructed at the moment, quite close together. Even though the cycle routes do not really follow the new roads, they are mostly solitary, the cycle routes will cross the motor traffic routes precisely at those two Turbo-Roundabouts. One will get a bicycle underpass and one a huge bicycle bridge. This to increase the variations when you cycle, a variation the landscape of this area lacks. The bicycle bridge has been finished very recently, the underpass is still under construction. 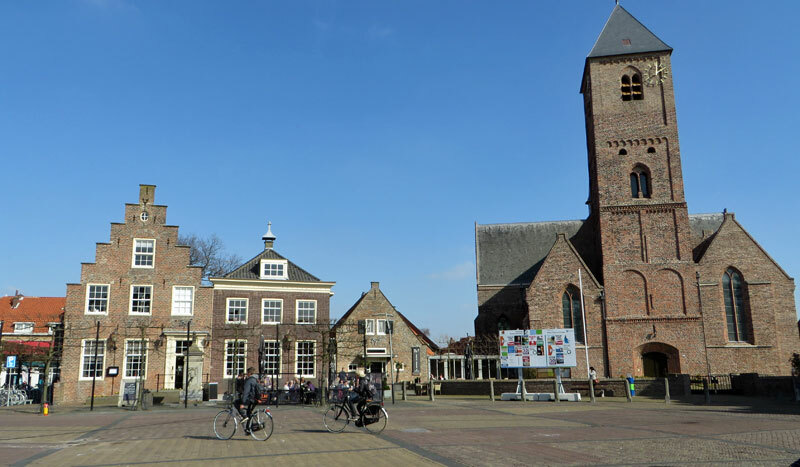 With new roads around the village centres in the municipality of Westland, this Naaldwijk square can remain completely free of motor traffic. We find Naaldwijk in the province of South-Holland between Delft/The Hague and Hook of Holland. In Dutch that last name means ‘Corner of Holland’ and somehow the motorway network in this corner of Holland was never finished. The A20 stops south of Naaldwijk and the A4 was interrupted. Without motorways and without a railroad, the regional roads in this area had to digest an amount of traffic that is generally only possible on motorways. FloraHolland is the world’s largest flower auction company. In its auctions 90% of all Dutch flower trade takes place (they had a turnover of 4.5 Billion euro in 2013). Even though their export site is in Aalsmeer (closer to Schiphol) and many auctions are now done without the goods physically being at the auction itself, I saw more Heavy Goods Vehicles on the roads in this area, than I have anywhere else in the country. We don’t want these HGVs mixed with people cycling. That doesn’t happen in the rest of the Netherlands, so certainly not here, with so many of them! The buildings of FloraHolland in Naaldwijk are vast. This work of art is a reminder of what product is auctioned here. 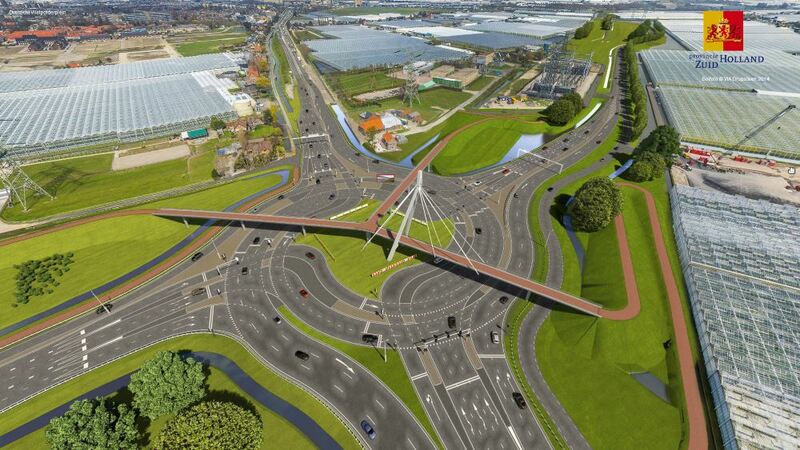 The gigantic turbo-roundabouts needed grade separated crossings and for the one on Vlietpolderplein, that can be considered the entrance to Naaldwijk, it was decided that a new landmark would be constructed: a gigantic cycle viaduct. The concrete bridge was constructed on site and it is 300 metres long. It is held up by one 40 metres tall central pylon. It was opened on Monday 9 March 2015, but it wasn’t completely finished when I filmed it. A top layer of asphalt will be added later. The province wants to test a completely new type of asphalt, that won’t even get slippery in temperatures of minus 5 degrees Celsius. This will reduce the cost of maintenance and the cost of keeping the bridge free of snow and ice. The viaduct cost 7 million euro and it was paid by the Province of South-Holland, the (now dissolved) city-region of ‘Haaglanden’ and the municipality of ‘Westland’, that Naaldwijk belongs to. Many people came to the bridge to see and experience it for themselves. Clearly visible is the concrete surface that will be covered with smooth asphalt in the near future. You don’t often see such a large name sign. 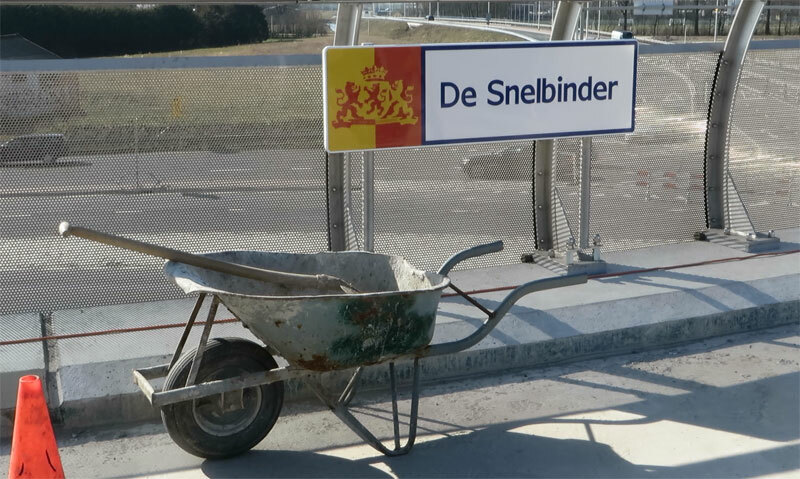 The wheelbarrow was used by a man who was putting some finishing touches on the bridge. My video showing the viaduct and people using it. My second video shows a ride across the new viaduct. I replaced the fierce wind sound with music. This new cycle viaduct offers a great and unusual view over the roof tops of all the green houses in the area. The landscape is now all sand, which is also unusual. Once the grass has grown in spring, the area will be green again and it will also stay green next winter. The ramps seem long to some viewers, but the complete crossing took only two minutes. A route that has no signals always feels quicker and more attractive than having to wait for red lights. The view is also worth the climb. That the other crossing will be in a tunnel is very good as well. That gives the total route a really nice variation. I understand why most of the locals are enthusiastic and I expect this viaduct to be used well. 1 Cheaper – only two bridges instead of three. And shorter bridges. Yes, but that is not as aesthetically pleasing! Remember this bridge is supposed to be a landmark, that’s why it has to go in the middle, to get all the attention. And you really make too much of those few metres you might have to cycle less with your version. Remember we have no hills here at all. We genuinely like these artificial hills, but longer access ramps make them easier to conquer. I also don’t get your aversion to a longer downhill slope. Isn’t it better to go downhill for a longer time? That means you do not have to pedal for a longer time. I’ve cycled this bridge up and down for a few times, it is a very attractive ride that doesn’t feel unnecessarily long at all. It needs to be long going uphill, but quite useless going downhill. Will there be shortcut tracks in the grass, I wonder? I see the bridge has v.long looping ramps to reduce the gradient. This makes the route look ’roundabout’ (sorry :)). And i see you note the clearance is still tight under the bridge. I take it the road can’t be sunk due to risk of flooding. Funnily, Copenhagnize was criticising some plans for the new London cycling bridge as too ‘squiggly’, coz they had looping ramps too. “One mans meat is another mans poison” sprang to mind :). I suspect the difference may be in whether the squiggles are necessary. This bridge needs to go up and down over something, and a long ramp reduces the gradient nicely on the uphill, and is no effort on a bike going down. Whereas the new bridge in London doesn’t need to be anything but flat (see Vauxhall Bridge just next to where it will be for comparison). So adding long spiralling ramps is an… interesting… design choice. One Londoners in a hurry would be grumbling about as soon as it opened! 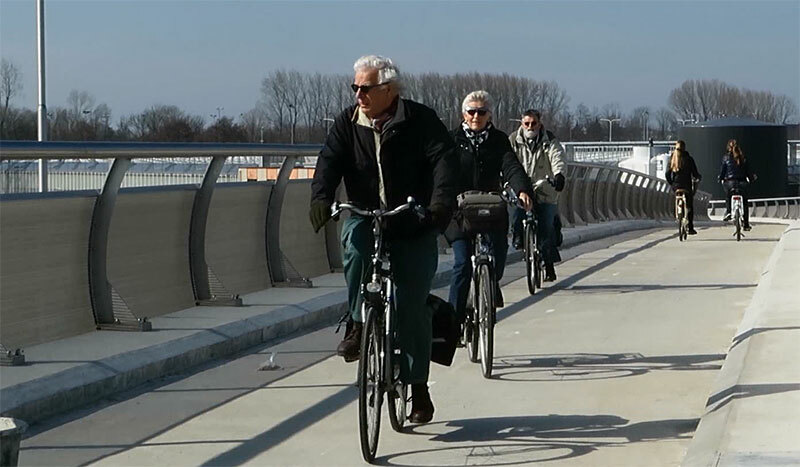 This is one of the few new bicycling bridges that have been been shown on this website which wasn’t built in a factory and assembled on-site. That building technique is something I rarely hear about in the U.S. Although, in the Los Angeles area, after the 1994 Northridge earthquake, engineers had to find a fast way to rebuild a overpass on a freeway without disrupting traffic down below. The same idea was applied. They rebuilt the missing freeway overpass section off to the side and slid it into place. Cities in the U.S. are still trying to find 101 ways to make pedestrian and bicycling improvements mainly using only paint and plastic. The plastic bollards are probably an improvement over the candlestick bollards that were the standard for cities over the last few years. These new style bollards can be run over by a motor vehicle and will pop back up to its original shape. I was recently surprised to find out that San Francisco is spending $55 million over a two year period on bicycling to try and reach their goal of 10% bicycling mode share by 2018. That’s about $32.8 per resident per year. The bicycle commuting mode share was 3.8% in 2013. The city bicycle count increased 7.5% in 2013. One thing that I’ve never noticed in any of the pictures or videos of the Netherlands on this website is telephone poles. The above video of the bridge does show a high voltage electrical power tower in the background. CicLAvia is the main factor in creating the political will for bicycle projects in the city of Los Angeles according to LA city council member Jose Huisar. There is not enough cyclists to create huge protests like there were in the Netherlands in the 1970’s, so instead why not have events where 10’s of thousands of bicycle riders show up. I asked a board member of CicLAvia how is it that they are able to hold these events all over the city. He said that the council members ask to have them in their district. Five council members out of the total of fifteen and the mayor were at the latest CicLAvia held last month. Think everyone in LA knows how to ride a bicycle. Here’s a video where newest LA city council member Nury Martinez shows off her skills after one day of practicing on a bicycle she bought the day before. 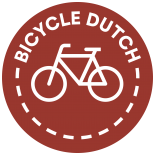 That first video at the end of my post was not the one I intended to show about the event, although the Flying Pigeon store owner shown in the beginning of the video is one of the few people in LA that sells Dutch bikes. Its tough to find any video of CicLAvia that comes anywhere near to the quality that you routinely turn out Mark. Lots of tries and experimentation, but few are enjoyable to watch. To answer your comment about telephone poles, in The Netherlands nearly everything is buried. That includes all the telephone cables. Often under the tiled pavement where the pedestrians walk. I know you hardly drive, Mark, but I’m curious if the “turboplein” is fairly new to the Dutch road design repertoire and to Dutch drivers. It seems to try and blend the fast merging capabilities of a highway with the the traffic signals of an urban road, and it has a lot of signs with red/white stripes. In other words, it seems that drivers are getting a lot of assistance (more than usual) from explicit signs and symbols. Some of those flowers are coming here! It will be interesting to see the new statue of Queen Juliana holding the baby Princess Margriet, who was born in Ottawa. In reply to nikdow I think it is better to have the bicycle bridge open instead of a tube, as you keep connection with the environment and have a good view on top of the bridge. Apart from the experience of being outdoors, It might not be the initial costs of building a tube, but the maintenance costs and social safety that prevent road authorities to build a closed tube. As always the cars drive flat and the bikes has to go up and down the hills. Isn’t it possible to dig down the motor road? Secondly, wouldn’t it been a shorter cycle route if they would have made the bride round the far end of the turnabout on the picture? As I wrote in the post they have varied what they build. Here a bridge, on another location very nearby a tunnel. It is a great ride. We don’t have hills here. So we are happy to have a view sometimes and it really doesn’t take more time to cross this bridge than it would on street level with signals. The route doesn’t follow the road and in the end the cycle routes in The Netherlands are always shorter than the motor traffic routes, which are diverted around all villages and other end-destinations. This is going to be my first port of call when I get of the ferry next week. Looking forward to it! I hate ‘autocorrect’, how do you turn it off, off, off?! Would it have cost a lot more to make the bridge a tube, with exclusion of wind and rain? We have an average rain time of 7% in The Netherlands. That means it rains for about 600 hours a year. However there are roughly 1000 hours of sunshine each year. And that is even without the dreaded grey days of nothing we seem to get a lot too. So it already does not seem to make sense from the weather perspective. Add to that the fact that tunnels make people feel less safe and less able to enjoy the sights, I think it’s safe to say that they should be avoided wherever you can. Technically that’s not even a turboroundabout but a turboplein (turbo square). Very original name as well as you pointed out. I wonder if in 20 years time we’ll have like 5 bridges with that name. FloraHolland doesn’t necessarily have to grow, the flowers grown in the area have to leave the area (to be sold) regardless of whether they’ve been brought to the auction or not ;). If ‘production’ of the flowers grows, so does the trucking. So even with the online-auction truck traffic can still grow. This entry was posted on 31 March 2015 by Bicycle Dutch in Original posts and tagged big bridge, exceptional cycling infrastructure, Naaldwijk.